Here is a birthday card that I made for my nephew Cole, who will be 3 on the 20th. I LOVE this paper. 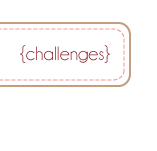 It is from Close to My Heart (CTMH) called Tinkerin. I definitely have to get more of it. 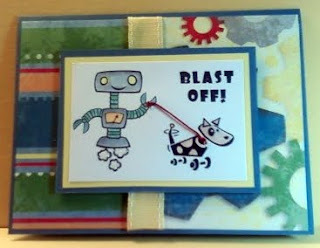 The main robot and message is from Recollections Robot stamp set and the dog is from CTMH Robot Power Stamp set. The ribbon is from Pebbles: Sun Yellow. That ribbon I got from a website called scrapbooksteals.com. I LOVE this site. They send you an email everyday for the 'deal' of the day. This ribbon was normally $60 and got it for $15. (or something like that). It came in all different colors and there were different variations of ribbon of the same color. Definitely sign up for that site. It's great.